SALVADOR...AND AS FAR INLAND AS HONDURAS. This afternoon the high temperature apparently hit at least 100F at both the NWS airport observation site (official high came in at 101F) and also at the atmo weather station. This first day of 100F plus temperature comes about a week to a week and a half later than the average first date during the past three decades. 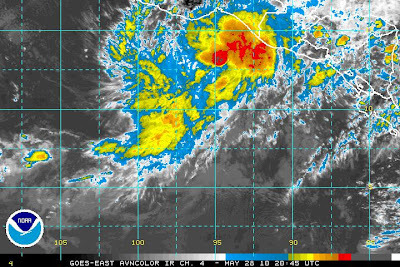 First eastern Pacific Tropical Storm of Season? OF CENTRAL AMERICA DURING THE NEXT FEW DAYS. 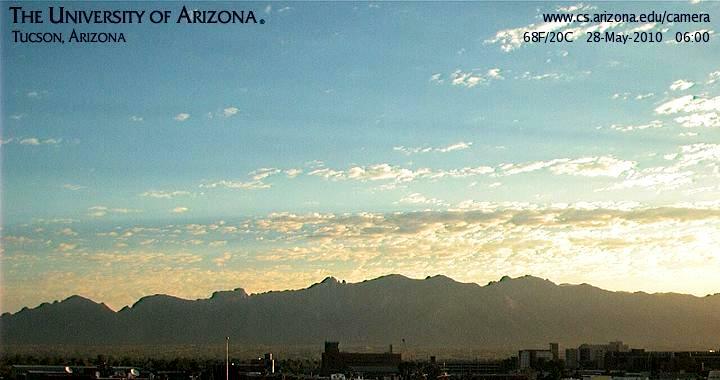 A beautiful sunrise this morning with scattered middle clouds drifting over the Catalina Mountains. It has been an interesting week wrt temperatures. I walk each morning around sunrise and note the morning low temperatures as I head out. This week the low temperatures, here at the house, beginning Monday morning, were: 40, 41, 45, 50, 55F. The high temperatures each day (for the NWS official observiting site at the airport) were 78, 87, 95, 99, TBD. So we had several more days with a diurnal swing of around 50 degrees F (at least here at the house - down at the balmy airport the official lows were 49, 50, 56, 60, 67F). Also, officially it hasn't hit 100F yet. Jimmy C. wrote - I wish they would deploy the double rh sensor I have read about with the dropsonde's, where if one rh sensor gets wet the other is used while the wet one gets heated until it is dry. The AMA sounding is not that bad (i.e. it should be able to be "fixed"), but the LBF sounding looks to have failed above 450 hPa. A couple of comments - I assume the new dropsondes mentioned above are the Vaisala model that NOAA contracted for last June (a large contract mostly for hurricane study and monitoring). The technology sounds interesting and expensive. I do hope that Vaisala prevails when the NWS replaces the inferior Sippican sondes. I continue to hear that the Sippican humidity sensor will be replaced asap and also that the evaluation process for a complete replacement of the current sonde is already underway. 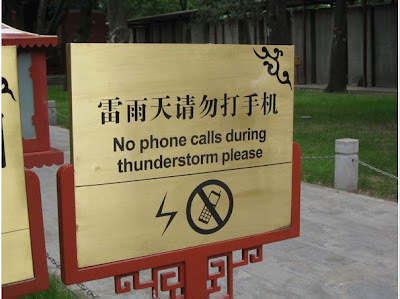 These are just rumors, since there is no official NWS information available (that I am aware of) about most of the problems nor about how the problems will be repaired. 2 - How does one "fix" a sounding when wet-bulbing occurs? We know that the lapse rate of T has gone awry and we can eliminate the extreme, unrealistic lapse rate. However, since wet-bulbing often occurs when the sonde moves from a saturated layer into a layer that is BOTH warmer and drier. Someone modifying the observed bad data can not know what the extent of the warm inversion (the inversion that has been destroyed by the evaporative cooling of the temperature sensor) actually was - therefore, such bad data can not be fixed, but one could make educated guesses as to what conditions might have actually been. The air mass to the east of the Continental Divide today has enough low-level moisture available to fuel some thunderstorms in New Mexico - see current visible satellite image at top. The NAM forecasts the moisture to increase some toward the west at middle-levels during next two days - this due to the influence of south to southeasterly winds associated with a weak disturbance moving slowly into northwestern Mexico. The NAM forecast of 24-hour precipitation ending at 5 pm MST on the 28th of May is shown in lower image. So there is some hope for a bit of a change from the deathly clear skies of the last few days. Chuck Doswell said: Both of these show supers coming out of nearly saturated regions below. That looks to me like wetting of the temperature sensor and then rapid evaporative cooling. Didn't the older Vaisala sondes also have this problem? It may be worse for the RRS package, but I seem to recall seeing similar things 'back in the day' before all of this mess associated with new manufacturers getting the contract for sensor packages. Two of the special soundings taken at midday today because of the severe thunderstorms in the western Plains. Both of above have strongly super-adiabatic layers aloft. This is a recurrent problem with the NWS RRS soundings that impacts the value of some computed severe storm parameters - for example, CAPE in the LBF (bottom) sounding. The above graphic is from U of A's CLIMAS summary of summer 2009. The top panel is a bit misleading for southeast Arizona - for example, here at house we had 0.08" of rain from June 15 through evening of July 3; but from July 3 through July 15 we had 1.52" of rain. 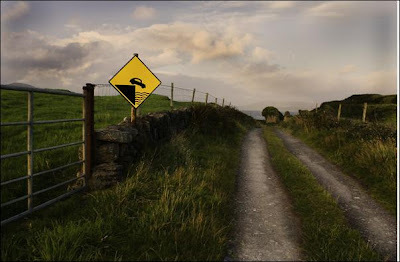 The outlook for summer 2009 is given two posts earlier. 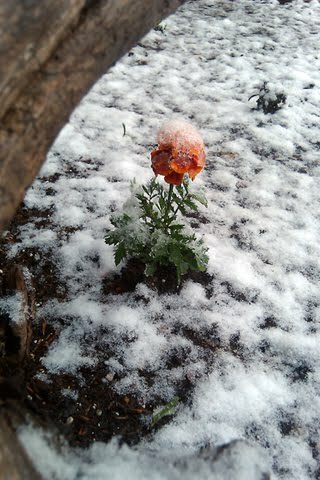 Wet snow this morning in the Salt Lake City area. Very cool morning here at house with a low of 40F - impressive events given it's the last week in May! John Diebolt (thanks John!) said: agree with the comments regarding the Climate Prediction Center's outlooks, the three-class system is misleading to the average person - They just look at the map and think well the darker the red, the warmer it will be, and those white areas mean normal temperatures, etc. Not to mention here in the SW we are seemingly permanently outlooked as above average to the casual observer. On a side note, I would like to offer kudos to Eric Pytlak for putting together his briefing. Monsoon season forecasting is terribly hard. Trying to refine so many variables into a local or regional-scale forecast would have been almost unheard of 10-15 years ago. Remember this time last year most indicators were pointing solidly to a wet and strong season? We wound up with a parade of low latitude closed lows well into early summer then a mid level high seemingly as jittery as a college kid on caffine- never in one spot for more than a day..and nearly always in the 'wrong' place for us. With the atmosphere/ocean circulations in such a rapid transition phase, anything could happen this year and I thought as a season opening salvo, Erik did a great job! 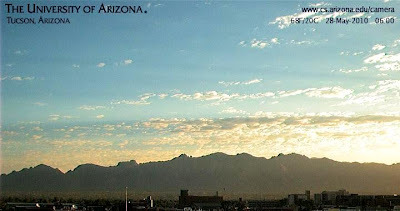 The 2009 monsoon in the Southwest is forecast to be early and wet. 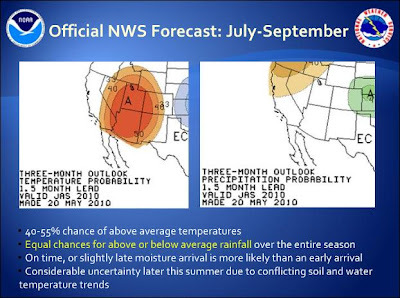 During a Web briefing Thursday, May 21, scientists from The University of Arizona; the National Weather Service (NWS); Servicio Nacional Meteorológico, Mexico’s national weather service; and the National Center for Atmospheric Research emphasized the forecast applies to June and July but becomes more uncertain for August into September. “The large-scale signal suggests the monsoon will arrive early and will be wet and strong,” said Chris Castro, an assistant professor of atmospheric sciences at the UA. The days leading up to the rains, he said, are likely to be very hot and dry. However, recent rainfall during the third week of May was not caused by the monsoon. The NWS forecasts a 33 to 45 percent chance of above-average rainfall in June, but the forecast becomes increasingly uncertain later in the summer, said Erik Pytlak, a NWS meteorologist in Tucson. One reason is that forecasts indicate a rapid development of an El Niño event this summer into fall, which can weaken the easterly winds characteristic of the monsoon and bring drier weather to the Southwest. As John reported in his comment - these outlooks didn't verify well at all. The summer storms and rains weren't early and the first part of summer was not wet (at least in the Tucson and Phoenix regions - I'm not sure about far southeast Arizona (Art ?). Those who read my blog last summer know that I often referred to the dismal summer weather as the "nonsoon." My first question for anyone out there with an opinion: With the current, totally ambivalent, situation, should the LOCAL NWS be providing any climate forecast information, other than repeating what CPC has to say and referring questions to the "experts" at CPC? 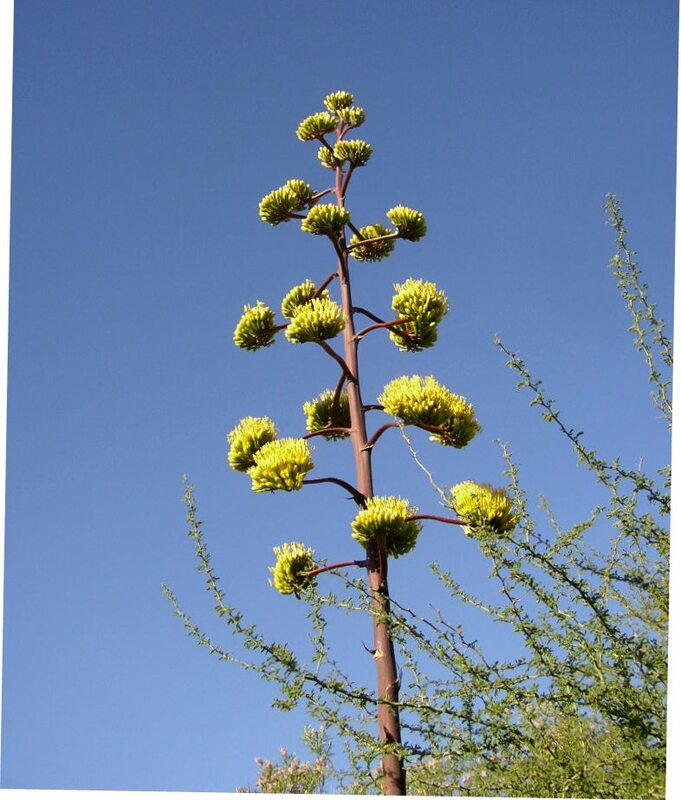 Although winds around the Tucson metro area have only been gusting up to 40 mph early this afternoon, they have been strong enough to take down the magnificent agave stalk that was blooming in the courtyard. Apparently the gusts swirling around the house and garage produced too much stress for the very heavy stalk. It's a sad loss since I had hoped we could have it decorating the courtyard until next winter. Back to some real-time weather. This morning a strong 500 mb short-wave trough is approaching central and northern Arizona (see the current NAM 500 mb forecast for 5 pm MST this afternoon - top). Strong low-level cool advection will be associated with the surface cold front that crosses Arizona during the day today (see the current NAM 850 mb forecast in lower panel). Front is coming off the Pacific fairly strong (currently 16C temperature gardient between Tucson and San Diego at 850 mb), but over the Southwest it will be fighting intense solar insolation. Looks like another dry, windy and dusty weather system - par for the course this time of year! More on the summer outlook later today. So this looks more like a gross misinterpretation by the media than a really dumb statement by the NWS? 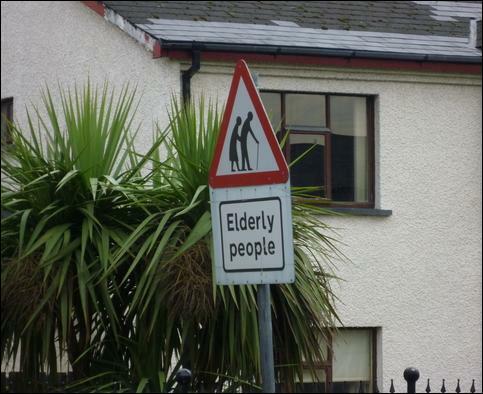 If so, I'm certainly not surprised about that. I think that there were stumbles at all three organizations involved in reporting this to the public. Climate Prediction Center produces a hard to understand product - check the link above and then think about what percentage of the general public, reporters included, could explain these maps to another person. Note that CPC now has an experimental version online that would outlook just two categories - above and below - and these charts should be more easily understood by general users. I think that the local NWS tried to produce a one-size-fits-all briefing rather than considering their three types of local customers (general public, media, and the local climate and weather research community). This generic approach produced a briefing that had problems regardless of which user community members actually hung in there and watched the whole thing. This is just my personal guess. The Arizona Star reporter, probably in frustration, wrote his cynical condensation of the briefing content for his online blurb yesterday evening. I suspect that he's caught lots of crap for the early version. It's going to be hot this summer, probably, and we'll have less rain or more rain than usual, according to the National Weather Service, which posted its first online monsoon briefing for 2010 on Thursday. The North American Monsoon, a seasonal shift to southerly winds that brings moisture to the Southwest each summer from the the gulfs of California and Mexico, responds to a variety of atmospheric circumstances. 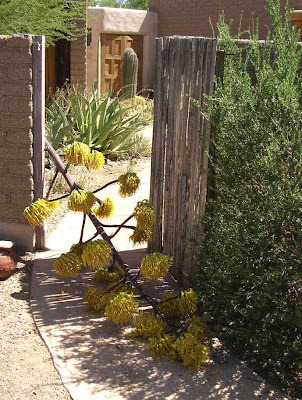 Generally, Southern Arizona receives less summer rain when the winter rains are above average, as they have been this year, said Erik Pytlak, monsoon researcher with the National Weather Service in Tucson. That's because moist ground in the Plains states slows the heating needed to lure a high-pressure system northward from Mexico. 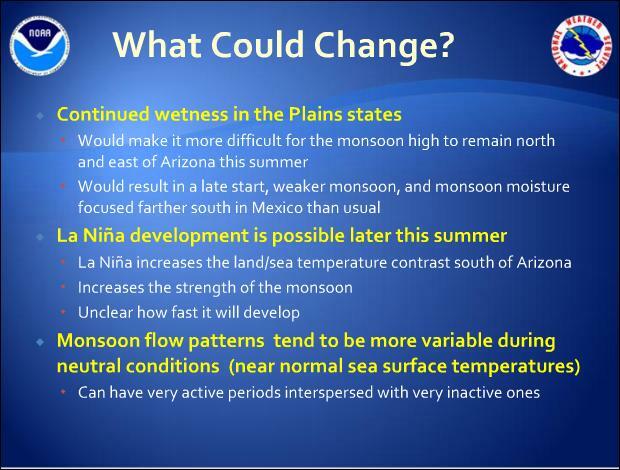 The monsoon, which usually brings thunderstorms to Tucson by early July, won't start early and could be a little late, Pytlak said. The monsoon could intensify later in the season, however, if the Pacific Ocean cools, a phenomenon known as La Niña - the flip-side of the El Niño warming that cut off last summer's monsoon prematurely. Cooling oceans increase the contrast between temperatures over land and sea. As the sun warms the land, heat rises and cooler, moister air rushes in. The computer models are divided on whether the ocean-cooling phenomenon, known as La Niña, will occur. Right now, most models call for average ocean temperatures, a condition the scientists call "El Niño neutral." "In an El Niño-neutral year, the most likely thing to happen is near average rainfall," Pytlak said. Officially, the National Weather Service forecasts "a 40 to 55 percent chance of above-average temperature" and "equal chances for above or below-average rainfall." "There are conflicting signals out there now and quite a bit of uncertainty," Pytlak said. While this might be a somewhat out-of-context statement (I don't know one way or the other), at face value, it's just outright embarrassing for the NWS. One would think that statements like this need to be reviewed by someone capable of finding such gaffes before they're disseminated. Is that too much to ask? My quick take on the brief story that reporter Tom Beal filed online yesterday is that it reflected a cynical frustration with how little real information was conveyed during a fairly long briefing. He has filed an extended story this morning. The firestorm of mostly nasty or negative comments in reponse to the brief story posted yesterday is a bit surprising - putting the NWS summer outlook up there with some controversial policy and political issues that always have comments galore of this type. It’s going to be hot this summer and we’ll either have more or less rain than usual, according to the National Weather Service, which posted its first online briefing for the Monsoon season today. If you want to know why, you can listen to Weather Service monsoon expert Erik Pytlak explain it all. Have a great agave in bloom (they are generically called century plants because of how long it takes many varities to bloom) but I'm not sure of this one's exact variety. I do know it is very well-travelled. I bought it in about 1990 from Yucaa Doo Nursery northwest of Houston. So it came to Oklahoma by mail and then was planted in the backyard in Norman. 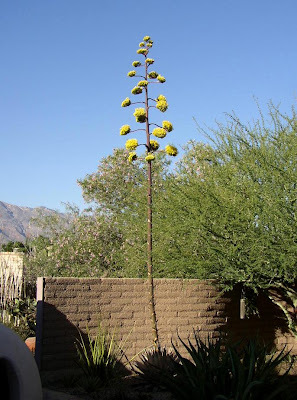 Around 1996 I moved it to Tucson in a pot. Then in early 1999 it was planted in a spot in our courtyard, where it is now blooming. The stalk is about 22 feet tall by my estimate. As with most agave, this is its grand finale, and it will gradually die as the summer progresses. Had To Turn On the Cooling Systems! cooling systems on for the summer. This is fairly involved for the main house and we are now committed to cooling and no heat, so this is a fairly important decision twice each year. 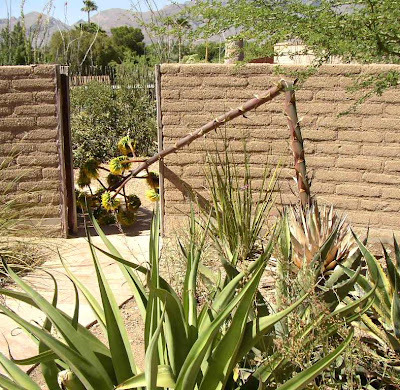 The main house is constructed of 16-inch wide mud, adobe bricks. With about 2 inches of mud plaster inside, the walls are about 18-inches thick. 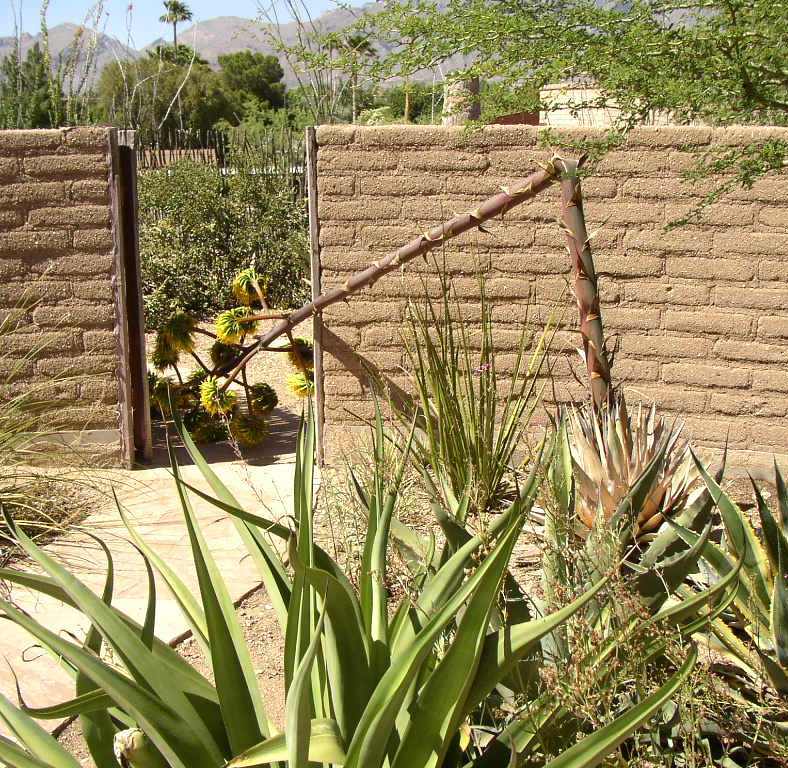 Thus, for about 3 months each spring and fall the thermal inertia of these massive bricks keeps the house cool/warm without the need for much use of the heating/cooling systems. Very nice for the utility bills. Of course the other six months of the year the heating/cooling systems are fighting the thermal inertia of the bricks - so all-in-all, yearly utility costs may be about the same as for other types of construction. Very impressive bow-echo line of unusual, early morning storms out to west of Del Rio, Texas, straddling the Rio Grande. The IR satellite image at top shows a spectacular horseshoe shape of the cold tops, with an interior warm-wake. This signature nearly always is associated with storms that are severe. There were two nighthawks (sometimes called bull bats) flying low and hunting insects over the house at dusk last evening. 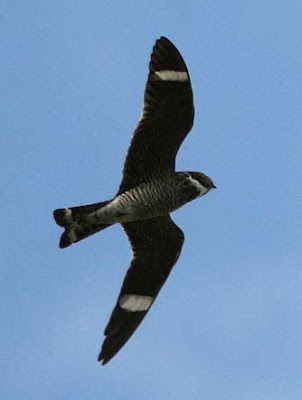 This was my first sighting of the nighthawks this year - their return is a sure sign that summer has begun here. These birds apparently winter in South America. Later in the summer I've observed as many as 20 to 40 birds within a couple of hundred yards of the house. 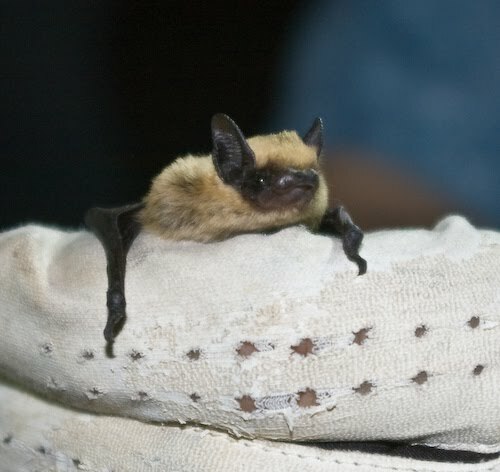 Their erratic flight as they pick-off insects appears similar to bats and is probably where the bull bat name came from. They are quite amazing to watch as they fly very low and fast, somehow avoiding collisions. About 4 tiny bats make their home among the vigas of our front porch each summer. The bats returned early this week for about the eighth year. They are very small bats and start hunting insects in the early evening. They look much like butterflies when they are flying around - so much so, that I've always called them "butterfly bats." 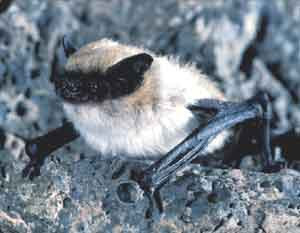 They are officially known as Western Pipistrelle bats, and they are now in residnece here at the house for the summer. One from Norman, right outside of the Storm Prediction Center, and one from Tampa, where the winds are really kicking up. Quick look at the new upper-air data and latest radar indicate a stormy night for northern Pennsylvania and southern New England. Very strong low-level warm advection occurring and upstream airmass increasingly unstable. Latest radar and Pittsburgh sounding shown above. The sounding appears to not be unstable enough to support a nocturnal derecho, but situation bears watching! Lots of Storms Central U.S.
And with lots of storms activie there are a number of strange looking soundings this morning. Looks like the Minneapolis data (above) capture honors for the most bizarre RRS sounding, with the flight apparently spending some time in an updraft and then coming out with a wetted RH sensor, resulting in a serious superadiabatic layer aloft. So it goes. I certainly can relate. I also realize that this warning can be interpreted in many ways. still haven't had to turn on cooling systems, which is very nice as well as economical! Images above show the MCS over central Missouri at around 3 am CST, with activity extending to parts of nearby states. There were some severe reports during the night, but not as many as I expected - see previous post. Have just been examining this evening's 00 UTC soundings. Very substantial CAPE from north-central Texas, across most of Oklahoma, and eastward across northern Arkansas and southern Missouri. Much of this region will experience strong low-level warm advection during the coming night and substantial severe thunderstorm activity is probable, even though the afternoon has generally been supressesed. First strong storms have just developed over western Oklahoma and they may reach to southern Illinois before morning. See Springfiled, Missouri sounding above, which is primed for rapid storm development. Thanks for re-lighting the RRS fire. Something of interest for you -- we currently have a group of people from the Sterling Field Support Center visiting EPZ. They are going to be launching comparison flights, testing different sondes starting today. This suddenly was announced to us all a couple weeks ago. Very surprising, as there has been no talk of RRS sonde replacement that I've heard. Wouldn't it be helpful if NWS alerted their own internal users about what's going on! And it would be amazing if external users of NWS upper-air data were filled in on both all the problems and the long-term plans for fixing the system. I have heard rumors that they (NWS, Observing Systems Branch, Chief - joseph.facundo@noaa.gov - if any readers have questions) are moving on a fast track to replace the flawed Sippican humidity sensor, and that the entire Sippican Microsonde will eventually be replaced. This is a continuation of the post below, so start down there. At top, graphic is the WRF 18 hour rainfall forecast from 12 UTC 4 August, 2008, after the model was initialized using the NWS NAM initial fields. Convective precipitation is over-forecast to a fairly serious degree (relative to the radar rainfall estimates shown in previous post). Mike subjectively corrected the PW initial field by removing 3 mm of PW from the lowest 100 mb of the TWC sounding (admittedly a brute force procedure). The results of a re-run of the WRF model are shown in the bottom graphic. Forcing the PW toward the GPS values apparently minimized the impact of the bad humidity data from the TWC RRS sounding, since the new forecast was much more similar to the radar rainfall estimates. This simple example indicates primarily that bad humidity data from RRS sondes does contaminate the NAM initial conditions. The NOAA folks in Boulder, who run the RUC model, have been experimenting with using the GPS PW in initializing the model. I'll see if I can chase down a reference. Mike Leuthold sent a link to his daily WRF model discussions - it is from 4 August 2008 and it is just a quick, subjective, example of how bad RRS sounding data can affect the WRF model forecasts. I'll have to do two posts to get four graphics up here. Top figure shows the TWC (Tucson) morning RRS sounding. This flight had a moisture sensor that was responding very slowly to changes in RH (this is my subjective guess at the problem on this flight) leading to PW contents higher than those indicated by GPS values. Bottom figure is radar-based rainfall estimates for the 24 hours ending at 12 UTC on August 5, 2008. The key thing to note is that the estimates indicate that the 24-hour period was very suppressed over southeast Arizona wrt convective storms. Bob, I wanted to comment on the occasional high bias seen in the CRP data. This bias occurs when IPW is typically above 30mm, but, of course, not always. I've even noticed this at Tucson during wet periods of the monsoon and this bad RSS data does make it into the models and also gives anomalously high CAPE values. So, it's not just a dry bias with the RRS! Jimmie C. says - Awesome plots and thanks for highlighting this issue in the Plains as well. Is the GPS data available online? I saw the GSD website has images but what about actual data files for select stations? I ask because I wonder how much balloon drift may effect the RRS PW. It is clear from the GPS data that there are rapid small scale changes occurring and I wonder if that has a big enough impact to cause the differences you are seeing. I suspect one could correlate the differences in PW to distance the balloon traveled. An off the cuff thought was to see how inversion strength or lapse rates might affect the GPS measurement. I certianly don't think the RRS moisture sensor is error free, but the randomness might be explained by multiple factors and then you get at the systematic issues. An interesting mystery and one worthy of exploring. Most of these questions/issues relate to the differences in, and the accuracy of, the two observing systems. I consider the go-to-expert here to be Seth Gutman at the NOAA labs in Boulder. 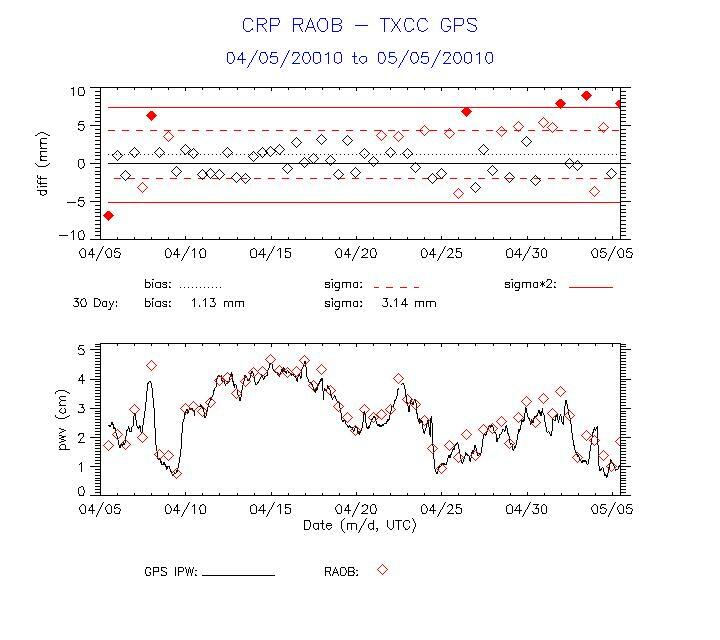 Since the GPS calculations are using data from a number of different GPS satellites, and thereby incorporating a number of "lines of sight", I suspect that the GPS observations may be more "representative" than are the RRS (or any sounding instrument) data taken along a trajectory determined by the local winds and rate of balloon rise. I do suspect that the first order problems with the RRS PW values relate to sensor problems of several types. Since most of the PW is present in the early part of the flight, the 4-D trajectory may contribute much less to inaccuracies, except in the case of extreme horizontal gradients. Several interesting issues relate to your questions. It should be straight forward to examine the data observed in any sounding with respect to: where were the data actually taken in time and space. Of course, it is much easier to assume (falsely, of course) that the observed data are positioned directly above the release point. At some point in the fairly distant past such an assumption was easily justified - however, it is much harder to justify such an assumption given the computing power available today. I am constantly amazed that someone, or some organization, doesn't provide upper-level plots with the data properly located in space. Or, maybe someone does? The time issue is a bit tougher. I suppose that model initialization procedures could (or do?) use the observed data exactly when and where the observation occurred. 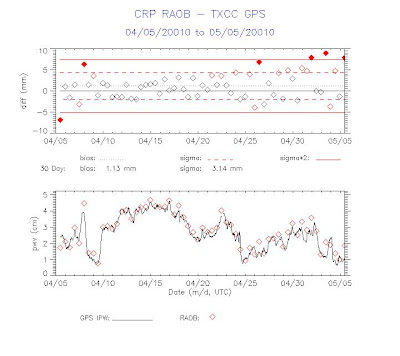 Another issue involves the standardized observing times for upper-air data. The reasons for taking data globally at 00 and 12 UTC were/are quite sound. However, given that 4-D data assimilation seems to drive things today, it would appear that all upper-air data might not need to be taken so rigidly wrt time. A local Arizona example - consider the NWS soundings taken near Flagstaff in the summertime. At 12 UTC in the morning the sounding typically samples an extreme surface-based temperature inversion, often making evaluation of convective potential difficult. 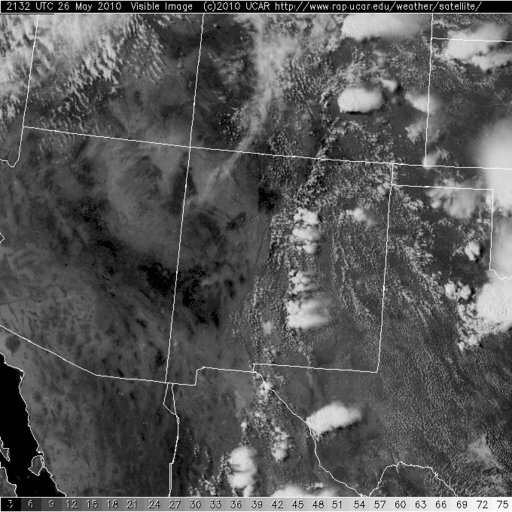 Convective storms up in the Flagstaff area tend to occur between 11 am to 3 pm or so in the afternoon. Thus, the 00 UTC sounding is often sampling a local environment that has been contaminated by storms. The obvious question is: why not allow the Flagstaff sounding to be flown at times more in sync with forecasting local convection? From John D. - Bob, I have read your posts about the dry bias in this eqipment for the past two Monsoon seasons here in AZ. I know the impact bad sounding data can have on modeling the daily forecast during the monsoon. Has this bad data had a negative impact on the GFS model itself on a much larger scale? I don't know if the various problems with data from the RRS sondes are impacting the GFS and NAM forecasts. I would think that folks at NCEF would be evaluating these issues. At times it is obvious that bad data have gotten into the standard level analyses and you'd think that, in such situations, there would be some impact on the forecasts. Remember that the NWS official position seems to be that the data problems with RRS sondes do not impact their forecasts. However, I know that short-term forecasts of convection can be adversely affected, and there are a number of posts here over the last two summers illustrating such situations. At U of A Atmospheric Sciences, Mike Leuthold runs a high-resolution version of the WRF model routinely. He has found that, especially in the warm season, the forecasts of convection within the model are strongly influenced by the initial precipitable water field. Since these are often inaccurate wrt to GPS precipitable water observations, he routinely uses GPS PW to "correct" the inital analyses of several NWS models. This winter alone it seemed as if ECMWF has consistently outperformed the GFS. (Maybe this is just my perception) I would think bad data going into a complex mathematical formula would exponetially increase errors forward in time..especially if the bad data was so random. On a side note, any thoughts on why the EC model did so well this past winter vs the GFS? I'm not a modeler, but even a fairly casual user of models has likely noticed that the ECMWF usually does better than the NWS GFS model (not always though, which keeps things interesting). I suspect that there are at least two things at play. The ECMWF operational time lines are not as stringent as those of NWS, and they spend more time and effort in the initialization process. I also think that the resolution of the ECMWF is superior to that of the GFS. Many folks on the Albany MAPS list could probably provide you a much better answer than I can. 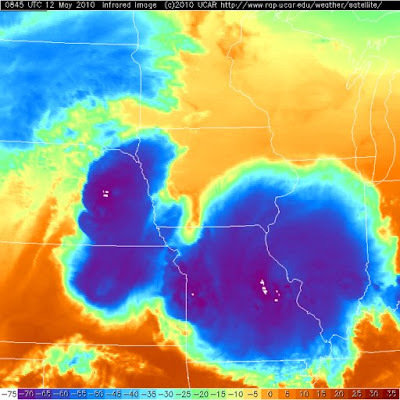 The current IR satellite image shows a classic (references on request) signature associated with the severe thunderstorm in northeast Kansas - this signature is often called a "warm-wake" with the coldest storm tops forming a horse-shoe shape down-wind of the highest tops,resulting in warmer IR temperatures in the wake of the highest storm tops. More in the morning - including my answers to John D.'s questions. Even though it is not yet 0300Z on May 7th, storms are already ocurring well south of where the NAM predicted precitation overnight. The storms west of Topeka (bottom radar image with Wichita at top) are obviously very intense storms and 2 1/2 inch hail has already been reported. An interesting situation tonight. The air mass over southern Plains has substantial CAPE but with a very large CAP. However, very intense low-level warm advection will occur over eastern Kansas and northwestern Missouri during the night, probably breaking the CAP considerably to the south of where the model predicts. Thus, it appears that thunderstorms will affect regions well south of where the NAM model forecasts precipitation overnight (top graphic). The new SPC outlook (bottom graphic) is better in line with the current meteorology, but perhaps a bit conservative. Currently there is an obviously severe thunderstorm, probably with large hail, just to the east of Salina Kansas and a new storm is forming near Topeka. A very interesting night on tap weatherwise! To continue from previous post - I also looked to the east to see how some of the sounding data were comparing to GPS data. 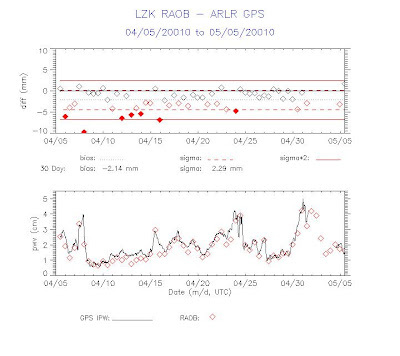 Top plots show the past month's PW comparison for Little Rock (LZK), Arkansas. 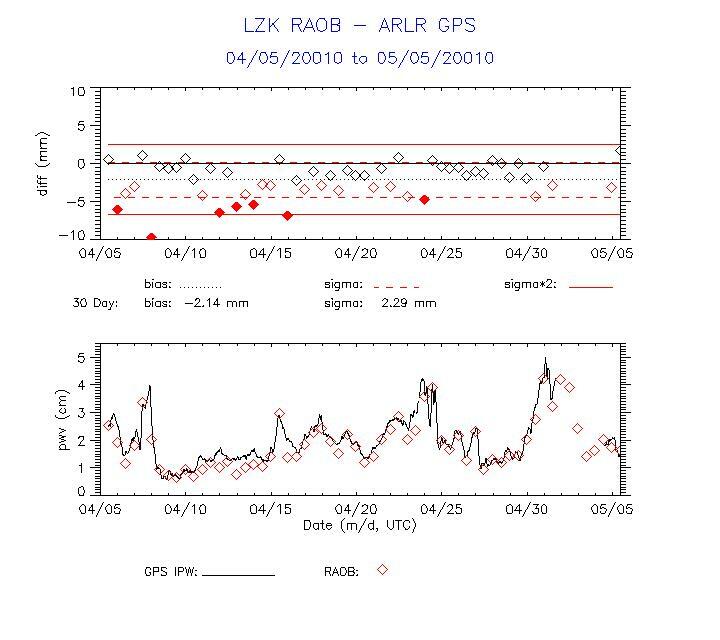 The data from LZK have been very dry relative to the GPS observations, indeed much more so that the two southwestern US stations shown in previous post. Bottom plots show the past month's PW comparisons for Corpus Christi (CRP), Texas. The RRS data at CRP is typically more moist than the GPS values. BUT, every once in awhile the CRP data are drier than GPS data - sometimes spectacularly so (as per the red diamond in lower left). So, the problems are not restricted to the dry domain of the Southwest US. They have a significant "random" aspect to them, suggesting that "correcting" the RRS data is perhaps an impossible challenge.